The logical explanation is that it is a typo, but we need to do an analysis of both documents to determine which might be more reliable. Marriage record filed by Rev. Holloway Whitefield Hunt Jr.
Rev. H.W. Hunt sent in the registrations of all the weddings he performed from 1832 to Oct 1845 on 10 Oct 1845.3 See note below. The record of the Hunt and McNair wedding was delayed by 7 years. It was transcribed from Rev. Hunt’s records and was not the record created in August 1838. A 1 and 7 look very similar and could easily be transcribed incorrectly when Rev. Hunt was copying from his records to the letter he was sending to the Clerk. While, Rev. Hunt was Susan A. Hunt’s uncle and most likely had a close relationship with his niece, he may not have an exact recollection of her wedding date. From the records he is reported, he had performed more than a hundred marriages in the 13 years; he may not remember the exact date. The letter is from Susan Adeline Hunt and she had first-hand knowledge of her wedding date to Rev. McNair. She had celebrated her wedding anniversary for 27 years from 1839 to 1866 (Rev. McNair died in January 1867). The letter is dated 9 Feb 1880 and was 41 years after her wedding. She was remarried to Isaac Eyears and has a new wedding date to remember 15 Sept 1875. 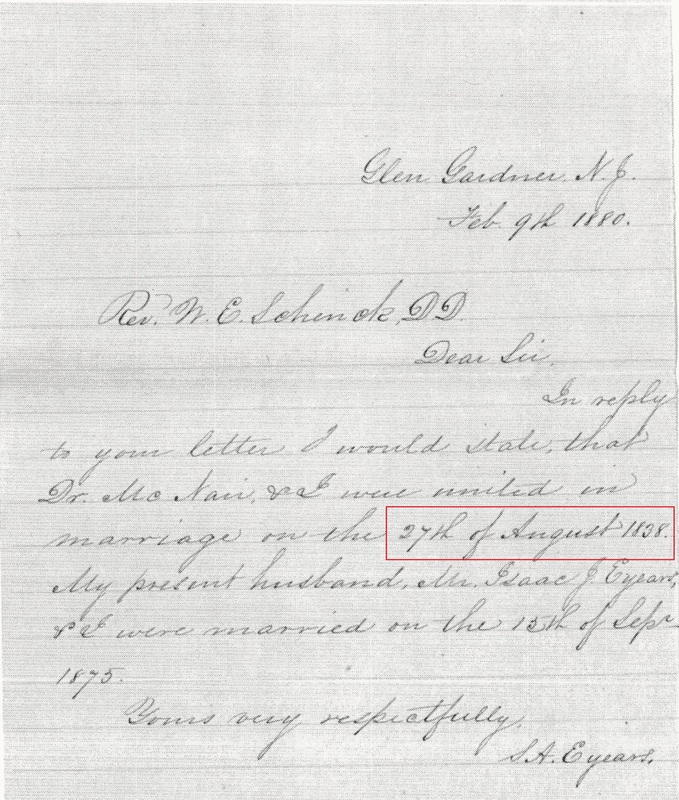 In her letter, her 1’s and 7’s look distinctive and there does not appear to be any confusion that she believes her wedding date to be 27 Aug 1838. Ideally, I would find additional evidence of their wedding date that could prove one side or the other, but that is unlikely. I was pretty excited I found two, I just wish they agreed. But does one week really matter? So is this an unresolved inconsistency? I tend to want to lean towards Susan’s letter, but could I make enough of a case with the information I have now? What do you think? 1 Letter from Susan Adeline Hunt McNair Eyears to Rev. W. E. Schench, D.D. ; Rev. John McNair File; Alumni/ae Files; Special Collections: Princeton Theological Seminary Library, Princeton, New Jersey. 4 Board for Certification of Genealogists, Genealogy Standards (Nashville, Tennessee: Ancestry, 2014) 27-28. 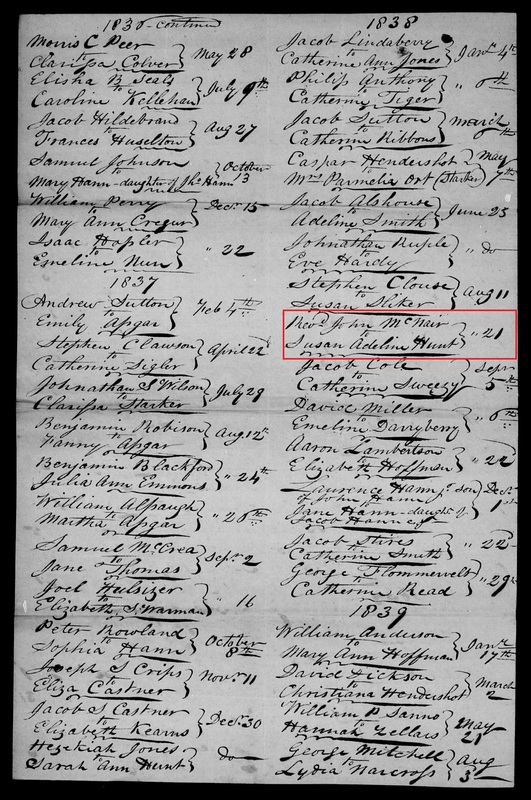 This entry was posted in Genealogy General, McNair Family and tagged Rev. Holloway Whitfield Hunt Jr., Rev. John McNair, Susan Adeline Hunt McNair Eyears. Bookmark the permalink. 4 Responses to Conflicting Evidence: When Did Rev. John McNair Get Married? I think that I would be inclined to accept Rev. H.W. Hunt’s date of the wedding. It is likely that he was copying from marriage register or record book when he compiled and sent in the information on the weddings he performed from 1832 to Oct 1845 on 10 Oct 1845. While Susan Adeline Hunt McNair Eyears was the one who got married, her letter accounts for an event of almost 42 years earlier. I don’t know….. I am sure Rev. 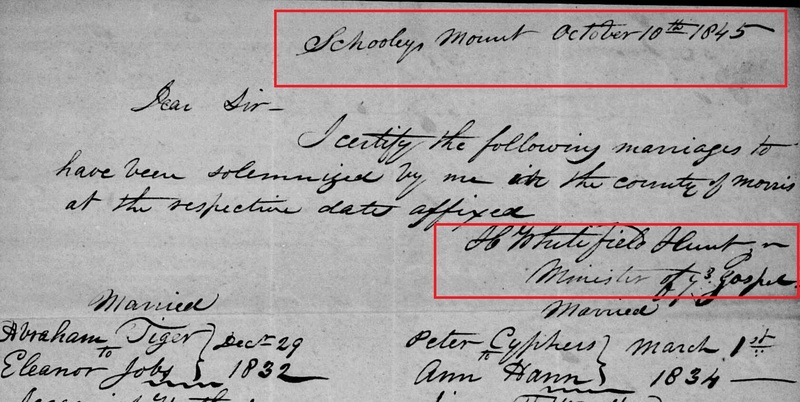 Hunt was meticulous, but we are taught that transcription of documents can lead to errors. Also, I was married 32 years ago, divorced for 19 years and I still remember the date of that marriage. I am hoping that I find some announcement in a newspaper or another source to narrow it down on one side or the other. I always appreciate your input, Allen! I did check on the day(s) of the week for the marriage and realized that really didn’t tell me anything. But I didn’t compare it to the other marriages he had done. Great idea!